Present state: The station has been demolished but a single concrete lamp column survives alongside the footpath that linked Hesketh Park station's up platform to the Henley Road footbridge. Hesketh Park station was on the West Lancashire Railway (WLR) Company’s Southport & Preston Railway which opened in stages between 19 February 1878 and 6 September 1882. The WLR was promoted by Sir Thomas George Fermor-Hesketh, Bart. Royal Assent was given for the ‘West Lancashire Railway’ on 14 August 1871. The Act authorised construction capital amounting to £150,000. James Brunlees and Charles Douglas Fox were appointed as civil engineers, and the contract for construction was let to Clarke Pruchard and Co. The first sod was cut on 18 April 1873 at a special ceremony held at Little London, in Southport, attended by the Mayor, Alderman Squire JP. From the start the WLR project struggled financially and, although construction started successfully, it stopped abruptly when the contractor faced financial difficulties. A further WLR Act of 1875 authorised the raising of a further £187,500 and granted an extension of time for the line’s completion. A new contractor, Barnes & Squire, was appointed, and work resumed. Hesketh Park station was built by Messrs Bridge and Co of Burscough Bridge and opened on 20 February 1878 with the first section of the WLR. At first it was the southern terminus, located where Southport’s growing suburbs met the countryside. The trains ran to Hesketh Bank (River Douglas). aligned with a gable facing the platform where there was a canted bay. Wings, with round-headed door and window openings, extended on both sides. The up platform had an enclosed, brick-built waiting shelter. To the north of the station, west of the line, was a goods yard with two sidings, one of which ran up to the rear of the down platform forming a kind of bay; engine and goods sheds were also provided. North-east of the station was Hesketh Park signal box. Located west of the line the box controlled movements along the main line and access to the goods yard. Beyond the goods yard were two uncontrolled level crossings, one of which was between the station and the signal box. The other known as Peets Lane crossing, was north-east of the signal box, gated and 16ft wide. After acting as the southern terminus for a few months, on 10 June 1878 the line was extended southwards to Southport Windsor Road, and Hesketh Park became a through station. From this date Hesketh Park was served by passenger trains between Windsor Road and River Douglas station (just beyond Hesketh Bank). closed on 5 September 1882, being replaced with a new facility at Southport Windsor Road. On 1 July 1897 the Lancashire & Yorkshire Railway (LYR) took over the WLR. From 1 May 1901 they closed Southport Central and diverted all WLR line trains into Southport Chapel Street. On 26 April 1898 a stationmaster’s house was ordered for Hesketh Park. The two-storey brick-built house was constructed adjacent to the station building on its south-west side. On 6 March an electric train was run though Hesketh Park from Crossens to Liverpool. A full public service began on 5 April 1904. Initially Hesketh Park was served by trains that ran non-stop between Liverpool and Southport and then called at all stations between Southport and Crossens. The station retained its train service to and from Preston. supplemented by 21 steam-hauled services that came from north of Crossens, most of them starting at Preston. There were 17 trains to Preston, one to Colne, one to Todmorden and one that was advertised as travelling ‘onward to the East Lancashire District’. The first departure from Hesketh Park was for Preston at 5:56 am. The last was for Southport at 11:20pm. Electric lighting was provided at the station in later years on typical LMS concrete standards. On 1 January 1948 Hesketh Park became part of the nationalised British Railways (London Midland Region). Throughout the 1950s the station retained its frequent electric trains along with a good steam-hauled service between Southport and Preston. On Bank Holidays additional electric services were run. In winter 1956/7 Hesketh Park had 21 weekday services to Preston, one each to Accrington and Todmorden, 34 weekday services to Crossens and 54 to Southport Chapel Street; 34 of the Southport services were electric trains that had originated at Crossens. 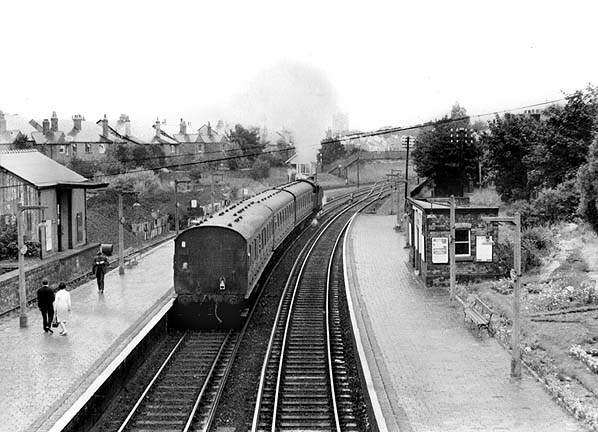 The Reshaping of British Railways (‘Beeching’) report of 1963 recommended the complete closure of the railway from Meols Cop through to Preston including the busy electric section, despite the fact that the services on the line were carrying over two million passengers per year. 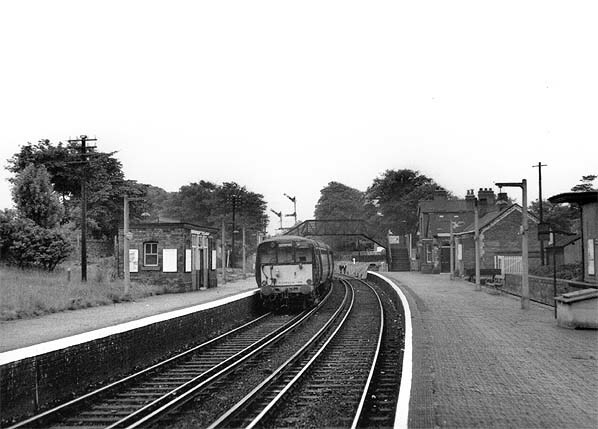 Although there were strong local protests all services were withdrawn with effect from 7 September 1964, and Hesketh Park station closed to passenger services. On the same day the down line through the station was closed between Hesketh Park and Whitehouse West Junction Preston, whilst the up line closed between Penwortham ground frame and Hesketh Park. yard sidings. Beyond the goods yard connection there was only a short section of track that ended at buffer stops. The weekday daily coal trains continued to operate to Hesketh Park until Friday 24 November 1967; on the following Monday a locomotive worked to Hesketh Park and removed the empty wagons from the previous Friday’s coal service. 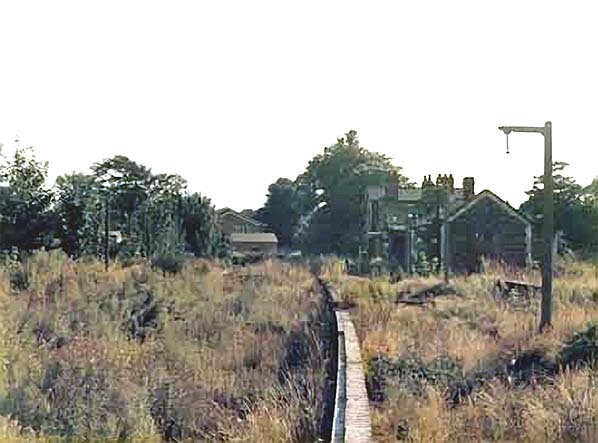 The signal box ceased to be staffed from Monday 27 November and was abolished on 9 June 1968, by which date it had become vandalised. The line between Roe Lane Junction and Hesketh Park closed officially on the same day. It was lifted by the end of 1968. The station stood in a derelict condition for a period after which it was demolished and later developed as a residential area. Despite the station site and the trackbed at Hesketh Park being completely built over in 2011 a lamp column from the footpath that connected to the up platform at its north-eastern end could still be seen. Tickets from Michael Stewart except 2509 Alan Castle, route maps drawn by Alan Young, Bradshaw from Chris Totty. 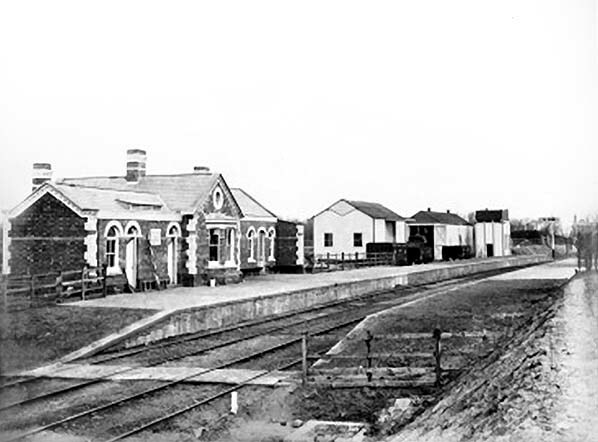 Hesketh Park station seen in 1878 when it was still under the ownership of the WLR. 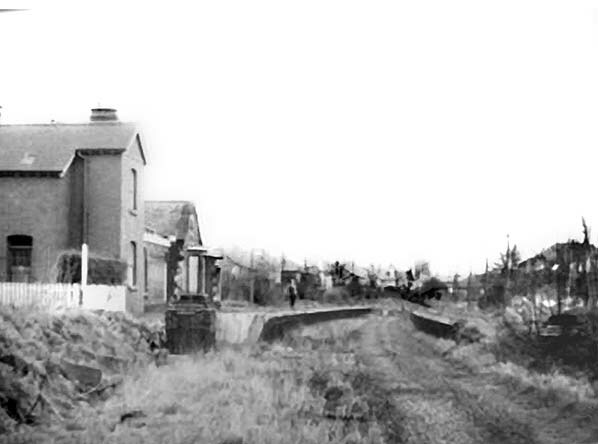 At this time it did not have an adjoining stationmaster's house, and passengers crossed the line by means of a barrow crossing which can be seen in the picture. Also of interest is the goods yard seen in the background. Beyond the goods shed is the short-lived 1-road engine shed which opened on 19.2.1878 and closed on 18.5.1882. 1890 OS town plan shows Hesketh Park station when still part of the WLR. At this time the station did not have a stationmaster's house or a footbridge. 1894 1:2,500 OS map shows Hesketh Park station as it was before the northern end of the goods yard was altered and the level crossing to the north of the station was replaced with a pedestrian footbridge. The station itself had no footbridge at this time. 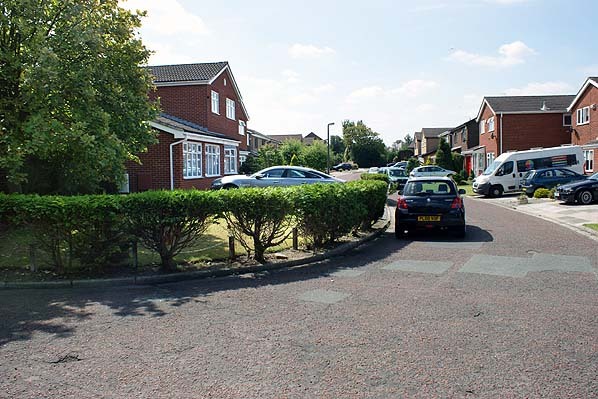 The large, detached villas in substantial gardens immediately west of the station indicate the upper middle-class area that it served.The short-lived engine shed which closed in 1882 (see picture above) has already been demolished. 1928 1,2500 OS map shows Hesketh Park station in its final form. The goods yard had been extended northwards, and a level crossing north of the station had been removed and replaced with a footbridge. Housing developments had been built along the western boundary of the goods yard. The station had a footbridge by this time, which was necessary as the line had been electrified using live rails in 1904. A station house had also been added. 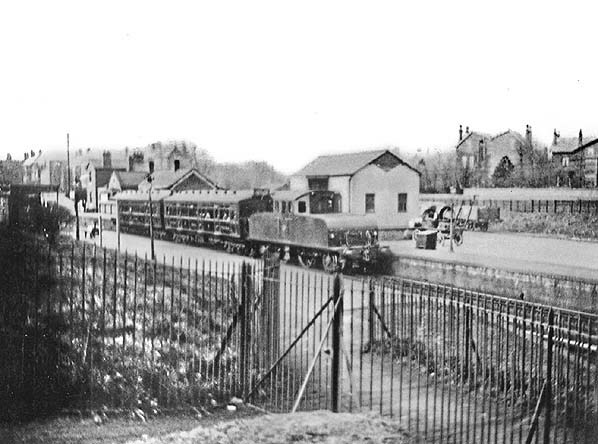 Hesketh Park station looking north-east from the footbridge in the 1930s. During this period the station was part of the LMS railway. The station’s goods shed can be seen to the left. 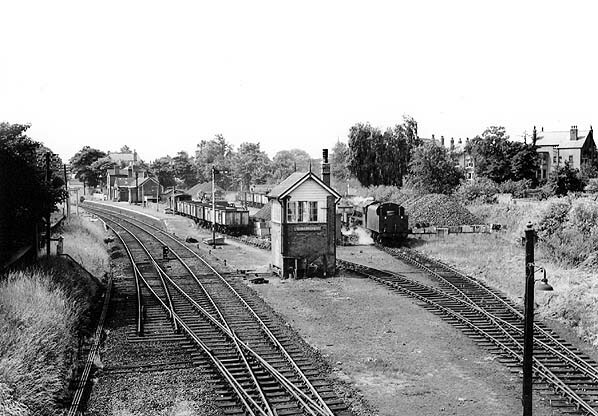 Looking south-west at Hesketh Park station in August 1964. An LMS EMU of 1939 vintage (later class 502) has just called at the station on a Crossens to Southport Chapel Street service. 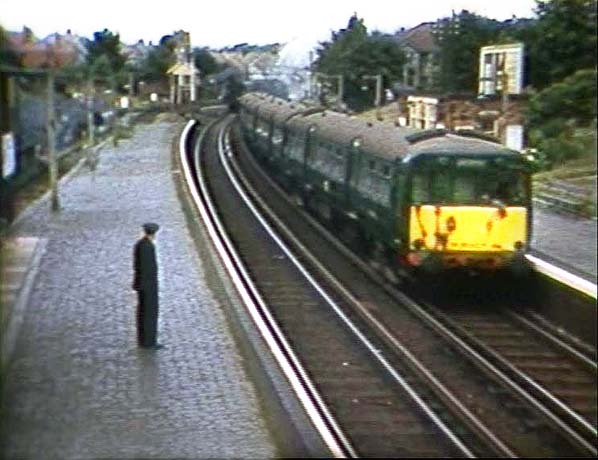 The electric service had been introduced in 1904 and ended when the line closed on 6 September 1964. After leaving Hesketh Park the EMU would take the east fork at Roe Lane Junction and head to Meols Cop. After calling at Meols Cop it would reverse and continue to Southport Chapel Street. A Crossens to Southport Chapel Street EMU arrives at Hesketh Park station in 1964. A steam-hauled service to Preston had just departed and can be seen in the distance. A Stanier 2-6-4T No. 42555 accelerates its train away from the rain-sodden platforms of Hesketh Park, with the 16:14 Southport - Preston on 5 September 1964. Evidence can be seen, in the form of the open doors of the goods shed to the left of the down platform, that the depot and coal yard remained very much in business right up until the very end - this photograph being taken on the penultimate day, 5 September 1964. In fact, No. 88 target (9T88) had left Southport Goods at 09:50 that morning for Hesketh Park. After shunting the yard here, it would then have reversed and, if keeping with its normal itinerary, taken the north curve at Roe Lane Junction in order to shunt at Meols Cop sidings, on the Wigan line. A further reversal, this time traversing the Meols Cop south curve, eventually would have brought 88 Target back to Southport Goods, where wagons would be re-marshalled into later services, leaving the area via Burscough. 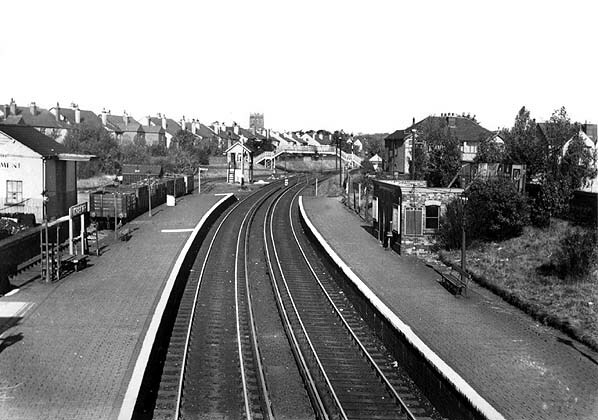 Hesketh Park station looking south-west from the Henley Road footbridge on 1 July 1965. Although passenger services had ceased by this date the station goods yard was still active. In the yard a Class 5MT (ex-LMS Black 5) locomotive number 45055 can be seen working a class J freight. It had worked the daily weekday coal train from Southport. After its loaded coal wagons were detached the locomotive returned with empties to Southport. 45055 was built in 1934 at Vulcan Foundry. It lasted until the end of steam and was withdrawn from 10D, Lostock Hall shed in August 1968. It was scrapped in February 1969 by Drapers of Hull. 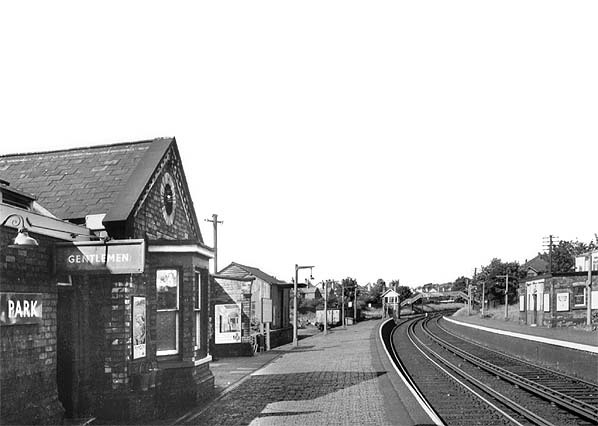 Hesketh Park station looking north-east in the late 1960s. Looking south-west along the down platform at Hesketh Park station in late 1970s. Houses had already been built on the trackbed beyond the station. 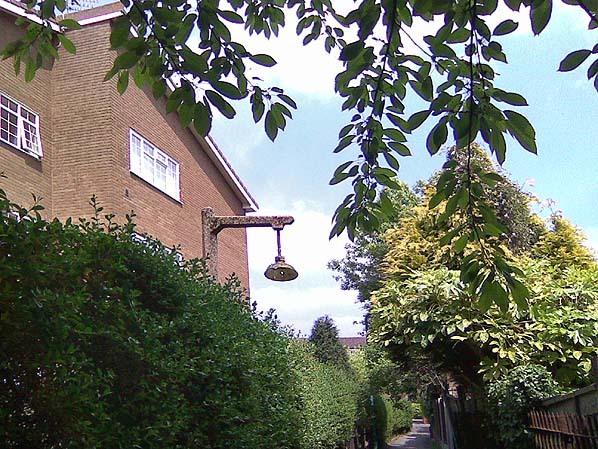 Looking north-east at a surviving lamp column from the footpath that linked Hesketh Park station's up platform to the Henley Road footbridge in 2011.